Samsung’s Galaxy Tab range of tablets have some of the nicest screens around, especially when you consider them against other Android rivals. The thing with Android tablets is that using one in a corporate environment is not easy when you want the full suite of productivity tools made available only on Windows. It is a good thing that Samsung is marrying the best of what it has offered on its Android tablets and loading them up with a Windows 10 Pro operating system. Hence, we have the Galaxy TabPro S.
The full-metal tablet is super sleek with the thickness coming in at a mere 6.3mm, plus it weighs just 696 grams. Samsung’s bright and colourful Full HD+ (2,160 by 1,440) Super AMOLED 12-inch screen with a narrow bezel is definitely a main draw. It produces 90 per cent of colour tones with clarity and sharpness, going by my quick hands-on test during its launch in Singapore on Friday. Powering the device is the 6th generation Intel Core m3 dual-core 2.2GHz processor, which is paired with 4GB of RAM and a 128GB of solid state drive. On paper, the tablet may not be a speed demon, at least compared to other PCs, but it should be sufficient for most day-to-day work. The multi-port adaptor splits the Type-C connector into three ports, providing a Type-C, an HDMI and a Type-A port. In terms of connectivity, the TabPro S has 4G+ support on top of the usual Wi-Fi. 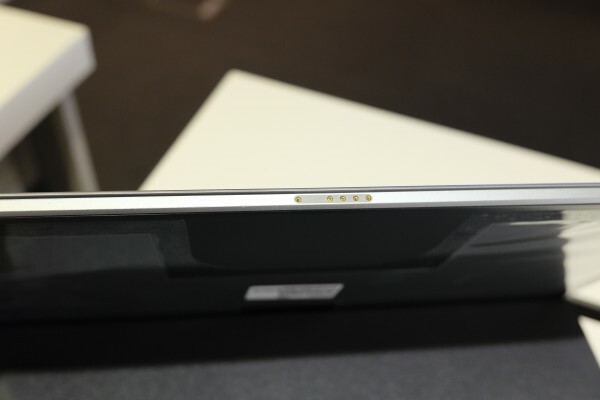 The tablet itself has a single USB Type C port, so you’d probably need an expansion port. 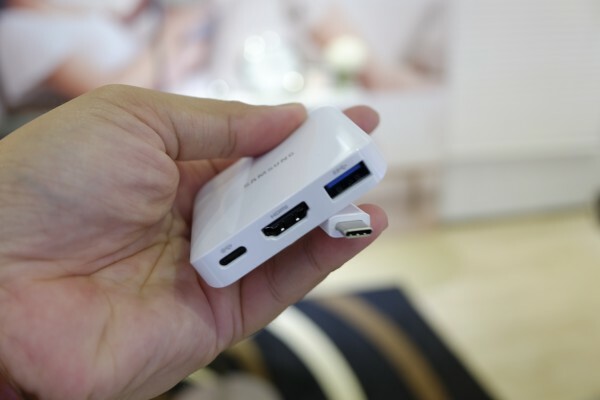 Be ready to fork out S$128 for Samsung’s multi-port adapter that brings a Type-A port, a Type-C port and also an HDMI port for showing images on a projector or a second monitor. 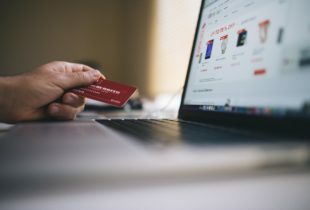 What’s missing though is an Ethernet connection, say, when you want to download the top speeds that your fibre broadband at home offers. You’ll need a USB Type C to LAN cable adapter, which Samsung doesn’t sell with the tablet. Good news is, there are third-party ones, like Targus’s docking station at US$179.99. The tablet has two angles for users to choose from when viewing the screen. 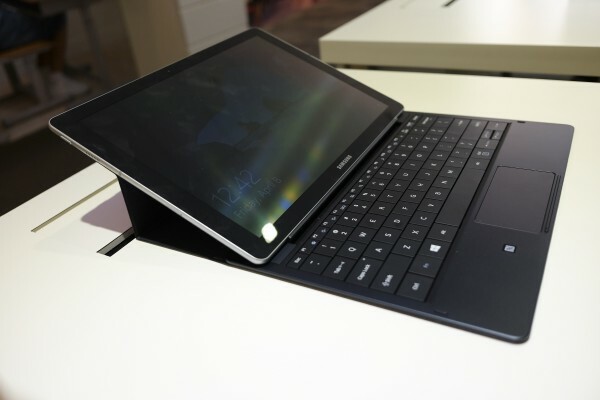 The Galaxy TabPro S comes with its own unique keyboard cover that provides two angles for optimal viewing. As it has direct connection to the tablet, it doesn’t need to be paired wirelessly or charged to be used. The keyboard itself is pretty comfortable to use as it gives a good tactile response while typing. The keyboard has connectors and snaps onto the tablet using magnets. What I would like to see is Samsung giving PC lovers the stylus that Apple has blessed its iPad Pro with. The Galaxy TabPro S has a pen called the TabPro Pen that’s sold separately for S$98. I didn’t have the chance to try this out the other day but I’m hoping Samsung doesn’t lose out in an area that it had pioneered with its Galaxy Note phablets in the past. If the Samsung TabPro S lets you scrawl notes or even draw as adroitly as the iPad Pro, then it has a big selling point over others in the increasingly crowded market. The bar is certainly higher now, since the iPad Pro’s stylus has given illustrators a very responsive and useful tool that Windows machines have failed to provide thus far. Imagine doing photo editing straight on the screen with the stylus with Photoshop or Lightroom. And at a fraction of the cost of a professional Wacom Cintiq pen tablet. Price-wise, Samsung’s isn’t pricing the TabPro S cheap. Costing S$1,698, it still requires you to fork out more moolah for things you’d probably need, like the multi-port adapter and stylus pen. I would hope that a more attractive bundle price will be offered when the tablet hits the stores in Singapore on April 30.